Demand generation is complex. 7,000-piece jigsaw puzzle complex. This dynamism is the root of demand gen’s power, as well as the seeds of its downfall. When marketers don’t get the whole puzzle to fit together, the result is a jumbled mess of marketing tactics rather than the masterpiece you get when every piece works in harmony to create the whole picture. You want your demand generation to create a cohesive, inviting brand environment that the audience can step into. Just like a completed jigsaw. The only way this is possible is by focusing on both short term and long term objectives to create a holistic demand generation strategy. What Marketing Tactics Are Part of Demand Generation? 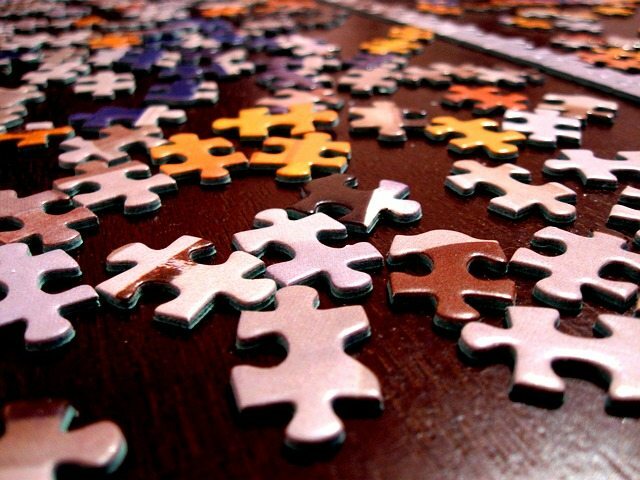 Before getting into strategy, what are the puzzle pieces that make up this modern marketing approach? 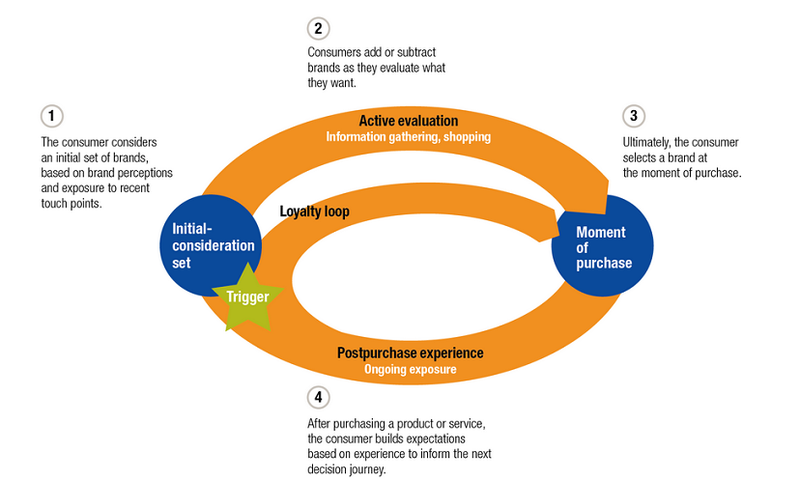 Demand generation includes touch points along the full customer decision journey, from awareness to purchase and back around again in the (ideally) never-ending loyalty loop. It is not lead generation but rather hook to sinker and back again by identifying the best prospects, bringing in those quality leads and yielding breakthrough conversion rates. This is why a strategic mindset is key. Marketers need to be able to see seven steps ahead and around the curve as the customer journey cycles back. These ingredients are then used to uncover the best prospects, narrow down leads and establish segments, and then customize content to create the most relevant brand experience for each segment. Step 1. Offer premium content, discounts, promotions or other giveaways. Don’t just stick with one offer or one channel, such as only written content like eBooks and white papers on your website. Use a variety to cater to different potential customers. Downloadable infographics, free trial periods, free apps or resources, or even promotional offers from relatable partner brands. With every download, sign-up or other customer action, you’ll gain insight and have a better idea of which segments are interested in what and why. Step 2. Offer more. This time make it a more intimate connection with the brand. This tactic serves to invite the customer into a more committed brand-customer relationship. If they’re interested. Webinars, events, and contests all work well. Step 3. Presto. You’ve helped identify your best quality leads. Differentiate them from the lukewarm candidates. Gather your data so far, and start customizing. Hopefully, you’ve managed to collect some extra customer info along the way with survey questions and feedback requests to help firmly establish your buyer personas and clearly understand each segment’s pain points. Step 4. Now the fun begins. It is the tailored, worthwhile content that will convince your vetted leads to follow you along until a purchase is made. With demand generation, the idea is to keep the content coming while using tools like A/B testing and lead scoring to continually assess the effectiveness of your content and the quality of your leads. Step 5. Customer delight. Keep engaging with your social media channels and email marketing to keep existing customers up to date with new products, promotions, and content – which you believe they will be interested in based on their previous actions. Meanwhile, your inbound marketing is working on gathering your next pool of prospects, ready to be identified, evaluated, thinned, and segmented. The thread that keeps the long-term strategy together is to continue to further segment or refine your identified segments to engage only with customized content and offers a buyer is definitely interested in. This allows marketers to focus on creating and investing in a high quality of content. You have a better idea of how effective it will be and for whom, as well as how it fits into the greater whole, which means more confident short-term campaign decisions. This approach does require a concentrated, ongoing effort to stay focused on your quality leads and customer retention. But, as the nurturing process continues, relationships build, bonds thicken, and your pool of the highly qualified swells. For B2B companies, demand generation involves offering a very professional level of content to appeal to prospects. Software company Atlassian does an excellent job of drumming up interest when a site visitor lands on their page. From hello, (landing on the homepage), the company offers different choices to capture interest. An introductory video, an infographic with more tailored content, a free trial offer, and a downloadable guidebook. What a prospect chooses indicates their level of interest in Atlassian’s products. Here’s an example from Tide, using Twitter to drum up some demand generation with existing customers. What an excellent way to attract buyers back to Tide. Specifically targeting the customers who may be tempted to abandon ship if they choose to look elsewhere for more eco-friendly laundry products, a competitive advantage Tide is not known for. 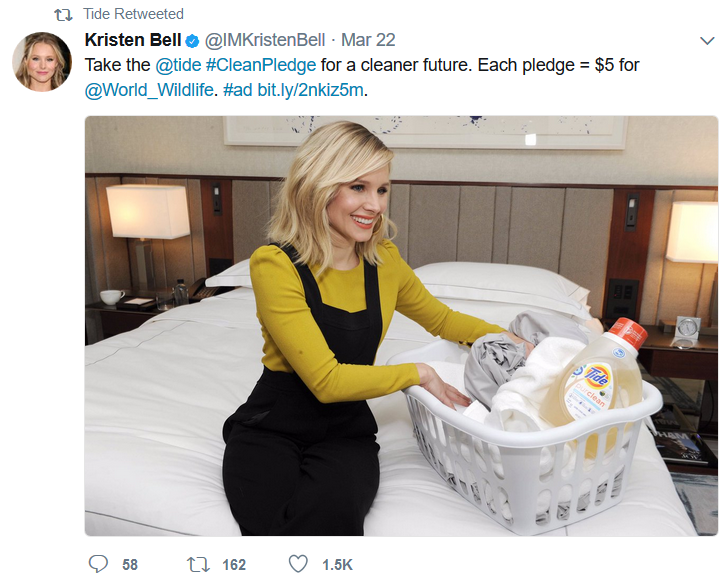 And, the brand’s marketing team uses a bit of well-played influencer marketing with actress Kristen Bell as a face for the campaign. Webinars are one of the best demand gen tools out there because when a prospect or customer signs up, they are making a commitment to continue the brand relationship at some point in the future. They become vested. Online marketing guru Neil Patel has built an empire on offering ‘more’ to create interest on his websites, which include Quick Sprout, Crazy Egg, and KISSmetrics. Demand generation a long-term game that requires a jigsaw puzzle strategy. The successful marketers, however, win big with a sustainable source of business and built-in growth.